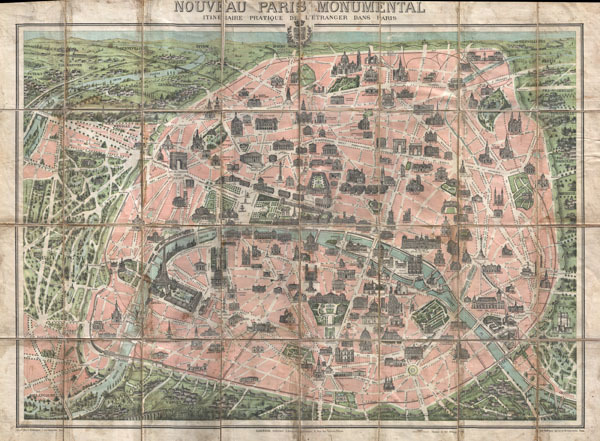 Important early edition of Garnier's popular map of the Paris Monuments. Nouveau paris Monumental Intineraire Pratique de L'Etranger dans Paris. This is an extremely attractive 1900 tourist pocket map of Paris, France. Published by Garnier Freres, this is most likely the 1900 first edition. Covers the walled city of Paris and the immediate vicinity from Billancourt to Aubervilliers and from Puteau to Charenton. Important buildings are shown in profile, including the Eiffel Tower, the Arc de Triomphe, Sacre-Coeur, the Pantheon, and others. This map was issued in various editions from, roughly 1900 to 1937. Though most examples are undated we can assign an approximate date due to the development of the Metro system and the map's overall style and construction. In this case the first Paris Metro line, the Chemin de Fer Metropolitain, from Maillot to Vincennes, appears but with only 8 of the 18 planed stations present - dating this firmly between July 19th, 1900 and August 6, 1900, when the remaining stations opened. Also, unlike later editions, this example is not incorporated into a tourist guide, but is instead a standalone edition dissected and backed on linen. This is a rare opportunity to own the first issue of this important map. Average. Map is dissected and mounted on linen. Exhibits considerably soiling and wear, especially along original fold lines.